The state of Pennsylvania has noticed. In February, Montgomery Elementary School received a 100 percent score on its Tier I evaluation for achievement in Positive Behavioral Intervention and Supports (PBIS), a program funded through the U.S. Department of Education. State officials told school representatives this was the first time they have ever awarded a perfect score. The school will receive a banner for display in the building at a conference in Hershey later this year. She noted staff and students must hold universal expectations of good behaviors and the rewards that go with them, a big factor in the evaluation by the state. Visiting team members randomly interviewed every level of staff and students and even spoke with kindergartners about rewards they earned, looking for consistency of understanding at all levels. For example, students needed to know exactly why they had been rewarded, to demonstrate learning. “It’s a very strong systemic and data-driven program,” she added. She noted the overarching goals of the behavior plan aim to improve student morale and school safety by decreasing risk factors that negatively impact students, combatting those risk factors with protective factors like a positive learning climate. With a foundation of “Be respectful, Be Responsible, Be Safe, Be Kind and Caring,” teachers thoroughly review with their classes twice a year the specific expectations in each category. They also explain the reward system implemented through the awarding of tickets to students who meet or exceed behavior expectations. Layers of incentives include daily pride tickets, bi-weekly grade level and classroom recognition, monthly MVP awards, and a yearly Hall of Fame honor. Special assemblies and other events also are used to reinforce good behavior expectations and achievement. A “technology day” offers fun activities with STEM principles that emphasize science, technology, engineering and math skills. Even a chocolate fondue party can offer a sweet incentive. Raider Pride League is built around a sports theme for extra fun. Each teacher chooses a team name for his or her classroom, like Martzall’s Monarchs for Pam Martzall’s hockey-themed kindergarten classroom. Pride tickets look like sporting event tickets and each classroom has a locker to store them. Each room also has a pennant to represent its sport and team name. 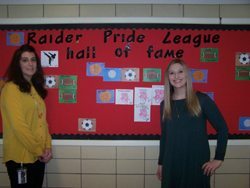 Part of the secret to reaching 560 students in the elementary school from pre-kindergarten to sixth grade is the full-throated, 100 percent buy-in from the staff, said both Condit and Snyder. That’s not just teachers: paraprofessionals, school bus drivers and cafeteria workers are all involved in teaching and reinforcing good behavior choices made by students. Raider Pride League began in the 2015-2016 school year when a staff team came together to plan program implementation for the following year. Although many teachers wanted to get started immediately, Condit noted it was more important to do very thorough planning first. With the solid plan in place for the following school year, the staff hit the ground running when school opened in the fall of 2016. Representation at multiple levels of staffing on the core team was by design, the principal noted. The team of 11 staffers includes Snyder and Condit, the school psychologist, a paraprofessional, the art teacher and several classroom teachers, although everyone in the school has the opportunity to take a leadership role, Condit emphasized. That includes students like sixth grader Mary Green. Fifth-grader Hayden Wilt likes the rewards program for following the rules. “Other schools should try it,” he recommended thoughtfully. Lomax, Green and Wilt each have big plans for the future, when their school days are over and they enter the larger world as responsible adults. Lomax sees herself as an interior decorator, a model, or a teacher. With two puppies at home Green is inclined to be a veterinarian but may consider a career as a singer. Wilt is athletically talented and would like to play professional basketball or football. The future for Montgomery Elementary School also looks bright. First grade teacher Samantha Mix and Reading Specialist Joi Sullivan recently applied for and received a $12,000 expansion grant to take the behavior program to Tier Two, a data-based, targeted intervention plan that will build on the unparalleled success of the Tier One program that precedes it.